Recently on Facebook there have been posts about two dogs being critically injured and in one case even dying due to the way certain dog toys were made. In both cases the dogs were playing with a toy that had one hole in it which created suction and resulted in the dogs’ tongues getting stuck. The good news is there is a way to avoid this. Check your dog’s toys to make sure that if there is one hole, there’s a second hole so suction won’t be created. If there’s only one hole, either drill another one or throw the toy away. If you have a tug toy that breaks apart (which can happen if your dog is an aggressive tugger) throw the toy away. Please share this information with dog owners that you know so we can help keep them all safe. The kids have gone back to school. The Fall fashions have come out. It’s September, but in Southern California it still feels like mid-Summer. That means it’s still rattlesnake season, and believe me they are out there. My 14 year old dog, C.C. was recently bit by a rattlesnake, and we thought that was the end for her, but she pulled through and is doing very well. I believe that she made it due to our speed in getting her to the vet and to the rattlesnake vaccination she had in June. The vaccination doesn’t guarantee a happy outocme, but it does buy you time and for a rattlesnake bite, time is important. I urge everyone that has a dog and lives in a rattlesnake area, or that walk or hikes their dog in a rattlesnake area to get their dog vaccinated. If your vet does not give this vaccine and you’re not sure where to get it, give us call and we’ll help you out. I’ve always been a believer in the rattlesnake vaccination; now I’m a believer with firsthand experience. 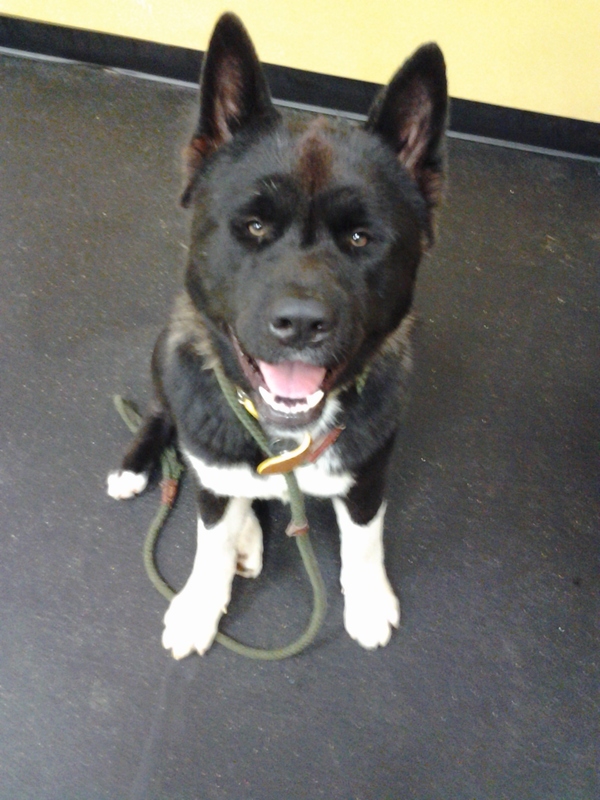 Jack Avenis is an Akita that comes to us for Boarding, Daycare, Grooming, and Training. Jack loves to fetch the tennis ball and play soccer with our big red ball. Jack’s girlfriend is Jolene (a Pitbull mix) and his best friend is Skylar (a Doberman). Have you ever tried to train your dog to stop doing something (for example, barking) and the behavior just got worse? This is very common. In fact it’s called an extinction burst. Basically, the dog is confused because something that has always worked before (for example, barking to get your attention) suddenly isn’t working so the dog thinks it must not be barking enough, so he/she barks more. Wait it out. The more you can ignore the behavior, the more it will start to disappear. But remember, if you give in, you’ll have to start all over again. As always, if you have questions give us a call at 760-739-7299. In August Steve and I were honored to attend the Boys and Girls Club of America Military Youth of the Year banquet. It’s an event that celebrates the accomplishments of several teenagers throughout the country. It was a great event and we were happy to be a part of it. 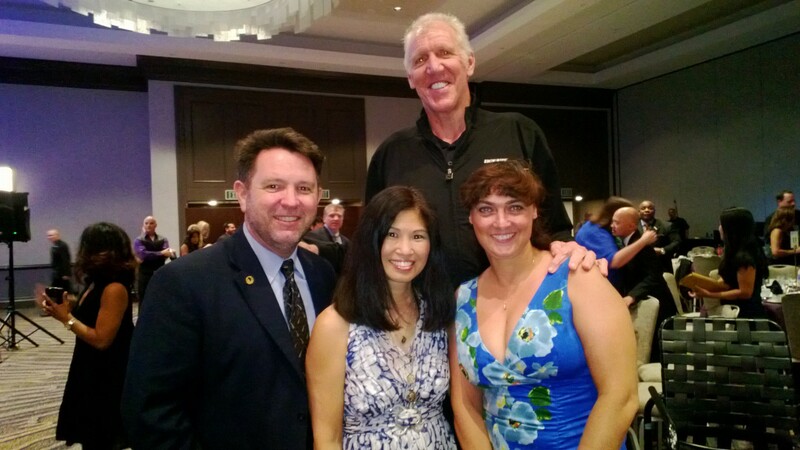 One of the highlights of the evening was meeting former basketballplayer Bill Walton and his wife Lori. Bill played college basketball for UCLA in the 70’s. He also played professionally for the Portland Trail Blazers, the Los Angeles Clippers, and the Boston Celtics. Bill was very friendly and we bonded while talking about his Mastiff, Cortez.